Why, you ask, am I tired? Well, as some of you might know, my husband just so happens to be a fan of anything ghostly and paranormal. He recently rented the entire first season of Ghost Hunters. If you have never seen Ghost Hunters, allow me to get you up to date. Its basically reality TV about these two guys who have started their own paranormal business on the side. Their day jobs have them working as plumbers for RotoRooter. Yes, I'm serious. So they both have this fascination with the "other world" and have in some way been affected by it (or so they think) and started their second job where they basically are hired to go into a place for the night, turn off all the lights and run around with cameras and special equipment trying to find ghosts/spirits/whatever you want to call them. Now, as I have said before. I don't like being scared by stuff that can't necessarily be explained. I am prone to nightmares that even creeped Jeff out when I woke up screaming and punching at the air. But, me trying to be the tough girl that I think I am and also wanting to spend some time with my husband sat down with him on Sunday night to watch this first season. So it started off okay, nothing really fascinating. They did catch some voices on their recorder and some orbs flying around. I was doing just peachy keen until they came to like the third or fourth episode where they go to a haunted lighthouse. We saw a chair move completely on its own. FREAKY! Ya. I could already feel the nightmares a-coming. He then clicked on a Sanitorium one and I about cried I was so scared! They heard actual voices, not recorded on recorders, but actually got them on camera like the person was right next to them! There were rocks that were thrown etc. etc. Oh and then we watched one on a prison where they actually saw a ghost on camera. My eyes are watering right now as I type this. I don't know what it is but when I get the creepies my eyes water. So my night on Sunday night was filled with ghosts popping up out of nowhere and chasing me throughout the night. We did the same thing last night (I was the one that suggested it though so its totally my fault- I just like spending any time I can get with Jeff) and my nightmares were a little worse last night. 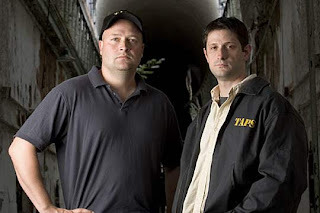 All in all I must admit that Ghost Hunters is a pretty cool show, but I am somewhat doubtful of its truth. Maybe that's the Catholic girl in me trying to believe that everyone (almost) should eventually end up in Heaven. I find myself a little conflicted with what I believe at the moment.